France Mourns Its Favorite Rock Star, Johnny Hallyday : Parallels Hallyday, who died Wednesday at 74, had a career that spanned 50 years. He recorded more than 1,000 songs and sold more than 100 million records — but was little known outside France. 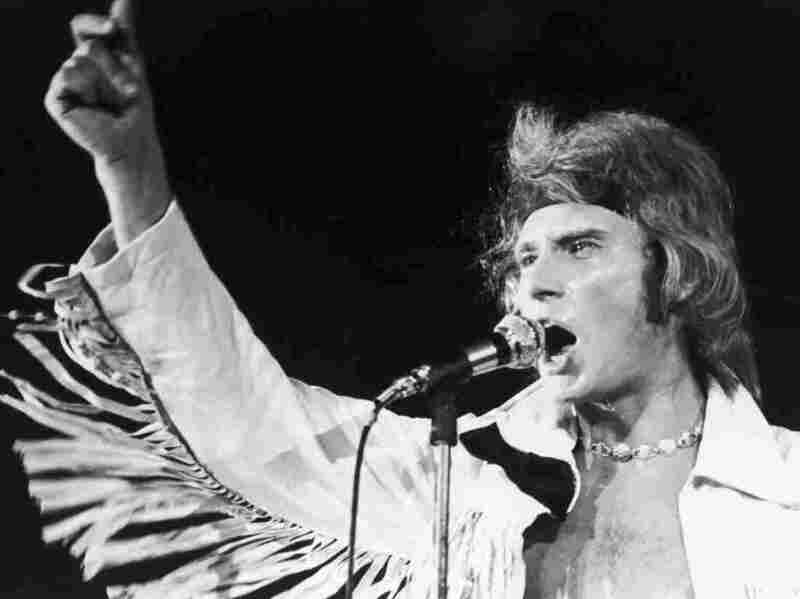 French pop star Johnny Hallyday on stage at Paris' Palais Des Sports stadium in 1969. In France today, nothing else matters. Johnny Hallyday is dead. The French rock star, who died at 74 of lung cancer at his home outside Paris Wednesday, had a career spanning 57 years. He sold more than 100 million albums, but was little known outside his own country. USA Today once called him "the greatest rock star you never heard of." Retrospectives and tributes have poured in, and France's Prime Minister Edouard Philippe paid tribute to Hallyday in Parliament. "Johnny Hallyday had a special place in our country," he said. "We are all emotional this morning. Every French person has a song that comes to mind when they think of Johnny Hallyday." Born Jean-Philippe Léo Smet in 1943 in Paris, Hallyday was abandoned by his alcoholic father and raised by his paternal aunt, a former dancer and silent film actress. Johnny Hallyday was surrounded by fans at Orly Airport in Paris, on his return from a tour of the United States in 1962. He found his calling the day he saw an Elvis Presley movie. As a teenager, he launched his career by imitating The King, gyrating and crooning to early hits like "Souvenirs Souvenirs." 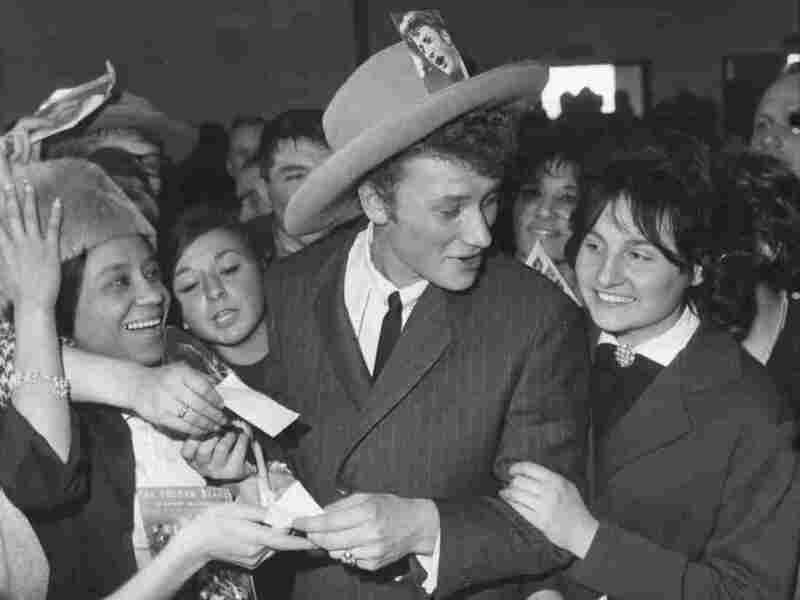 Hallyday electrified a French postwar baby boom generation desperate for freedom and fun. He brought them American rock 'n' roll sung in French, says Francis Viel of France's rock radio station Oui FM. "He brought this music back to France," Viel says, "but it was still the same energy, the same music, and it made it easier to be appreciated in France by changing the lyrics to French." Viel says because Hallyday always surrounded himself with talented writers and musicians, he was able to connect to each new generation while keeping his older audience. 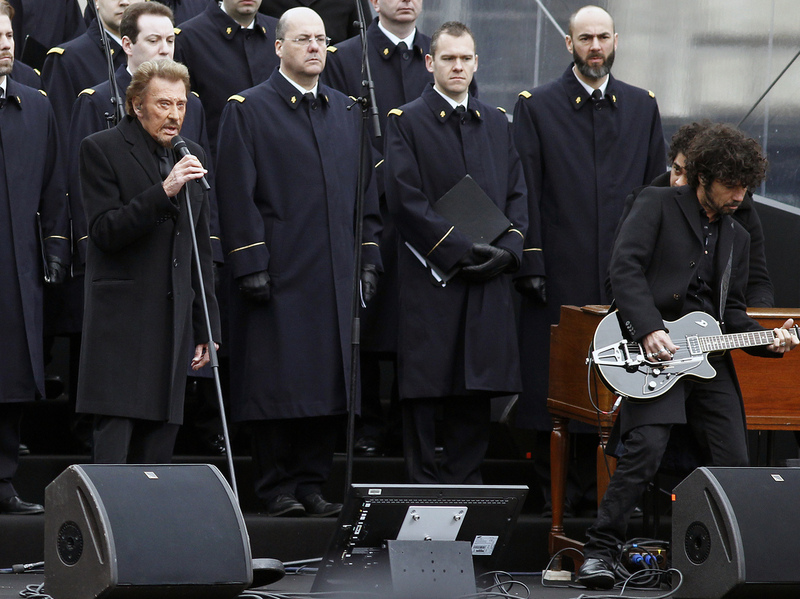 Hallyday sang in January 2016 during a ceremony at Place de la Republique to pay tribute to victims of the November 2015 terrorist attacks in Paris. Throughout the 1970s, the hits kept coming. Music critic Bertrand Dicale says over the decades, Hallyday was always in the game. "He was unique in our popular culture because he was not always No. 1, but No. 2 or 3 in sales, for 57 years. And always in different styles. Rock, twist, variety, sentimental songs. He covered all genres, styles and eras at the same time." Hallyday — who married five times and had four children — led a sometimes turbulent life, and as he aged, his craggy face reflected years of hard partying, drugs and alcohol. In a 1998 interview with Le Monde, Hallyday noted, "The impression of being a survivor is almost always with me. There's only me and Mick Jagger." While most people in the U.S. don't know who he was, Hallyday was always inspired by America. He lived part-time in Los Angeles, and crossed the U.S. on his Harley-Davidson motorcycle. One French news site described him as infused with Route 66 nostalgia and a mid-century American working-class spirit. Johnny Hallyday and actress Catherine Deneuve find a copy of Hallyday's Salut les Copains album at a record shop in Paris in 1962. One of his music videos shows Hallyday as a trucker, driving down an American highway in the 1950s and singing a ballad called "Quelque Chose de Tennessee." "We all have a little something inside us from Tennessee," he sings. President Emmanuel Macron called Hallyday a "bad boy" and a sentimental rocker who sung of conquest and broken hearts. "We have all suffered and loved," he said, "along with Johnny Hallyday." An earlier version of this story misspelled Francis Viel's last name as Ciel. The audio version of the story incorrectly refers to him as "Ciel."